Kapolei Ohana Patrol Squad members Leslie Mason and Rebekah DeCosta, in cart, watched for high school truants yesterday during lunch. Behind Honolulu police Officer Tony Pacheco Jr. were Sherri Shimamoto, left, and Suk Moses. A group of parents, business owners and residents is clamping down on students attempting to ditch class at Kapolei High School. 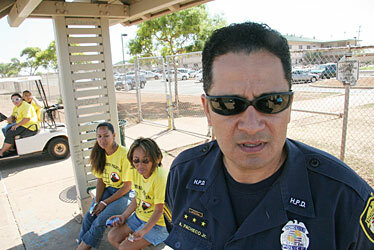 The Kapolei Ohana Patrol Squad began patrolling the perimeter of Kapolei High on Wednesday. So far, it has caught 20 to 30 students each day from Wednesday to Friday attempting to leave campus. No students attempted to leave yesterday. Honolulu police Officer Tony Pacheco Jr. of the Kapolei Police Station's Community Policing Team said the patrol seems to be working so far. Patrol members hope more parents and community folks will participate so they can do a daylong patrol while students are in school. In a cart that can intercept students, truancy patrol members Leslie Mason and driver Rebekah DeCosta took a spin around Kapolei High School yesterday with a cameraman in tow. Students at Kapolei High School who plan to ditch class might want to think twice -- the KOPS are on patrol. A group of 33 people -- including parents, business owners and concerned citizens -- recently formed the Kapolei Ohana Patrol Squad to try to make sure students stay in school. Leslie Mason, who has three children attending Kapolei High, said she was fed up with students sneaking out of school. She and her mother, Evelyn Souza, a member of the Makakilo-Kapolei-Honokai Hale Neighborhood Board, rallied some parents and met with school officials this month to discuss the truancy problem. "They wanted to be part of the solution," said Principal Al Nagasako. "I think it's great. It's another set of eyes and ears." The group began its patrol Wednesday. Members stopped about 20 to 30 students each day from Wednesday to Friday. Students were given warnings and no arrests were made. If students are caught a second time, an arrest will be made, said Tony Pacheco Jr., of the Kapolei Police Station's Community Policing Team, who is assisting the group. Yesterday no students attempted to ditch school. "It seems to be working," Mason said. Pacheco said the patrol helps to keep students in school. It also assists the Police Department because there are only two to three police officers who patrol Kapolei and Kalaeloa. Police equipped patrol members with radios and bright yellow T-shirts. Patrol member Rocky Paiva, Souza's nephew, provided the group with two golf carts to cover more ground. The group patrols the school's perimeter. Members check student identification cards, which indicate whether they are allowed to leave campus. Some seniors who are on modified class schedules are allowed to leave campus and return for their next class. Members also check whether students have a school-issued slip that allows them to leave school for varying reasons. Last Friday, members discovered a small plastic bag of marijuana located outside the chain-link fence on the mauka end of the school. Mason said she hopes more parents and community members will get involved so they can conduct patrols for the entire school day instead of just a couple of hours a day. Nagasako said teachers, happy about the patrol, have reported that more students are in class. While Kapolei High has a relatively low truancy rate with close to 90 percent of the student body attending school, Nagasako said any student cutting class is a problem. "They need to be in school," he said. Anyone interested in becoming a member of the Kapolei Ohana Patrol Squad can call Honolulu police Officer Tony Pacheco Jr. of the Kapolei Police Station's Community Policing Team at 692-4250.